I am an unashamed supporter of The Netherlands. It’s next door, but unknown to many British. (That might be perceived as an advantage, at least to us who have already discovered it!) It has history, beautiful architecture, surprisingly good food, art and individual design – chair design. Those national assets are not confined to Amsterdam but are scattered across this small country, making Holland an ideal leisure destination. Let’s consider both art and design, for they are often indistinguishable one from the other. Design is, or should be, about form following function, with art contributing aesthetics. When buying furniture one hopes to find a marriage of both design and art, with perhaps a little bridesmaid in the guise of comfort. Piet Hein Eek began making his Waste furniture in the 1990s as a result of finding that he was having to throw away wood left over from his other furniture projects. That concept of recycling of otherwise useless material for furniture and other household goods has been mimicked across the globe. The furniture was originally constructed by stacking up pieces of scrap wood that would normally be discarded. But there is another collection: the new Waste 40×40 collection takes a different and perhaps more practical approach. Piet’s process of furniture-making obviously results in waste wood in small amounts, and often in impractical shapes that are impossible to use. He cuts down all these pieces into identical squares of 40 by 40 millimetres. These are then glued together to cover the surface of chairs, tables and benches. The result is striking. 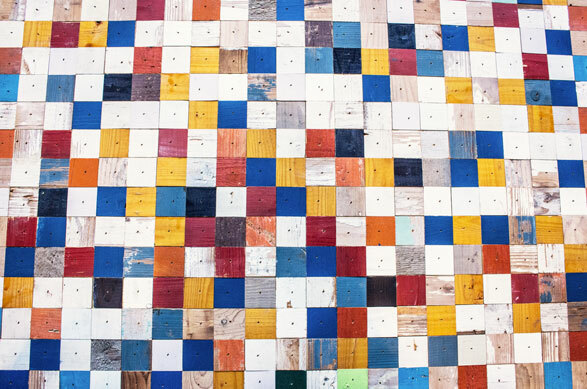 Those coloured chips create a tapestry which has become an iconic feature and a Piet Hein Eek trade mark. The Piet Hein Eek factory in Eindhoven is well worth a visit for chairs and more. Learn more here. There is another “Piet” and perhaps this one is a little more celebrated outside his homeland. This is Piet Mondriaan the painter. He has influenced not only artists but designers too. Mondrian (using the non-Dutch spelling) was a contributor to the De Stijl art movement which was founded by Theo van Doesburg. Mondrian is famed for the form which he termed neoplasticism, which consisted of a white background with a grid of vertical and horizontal black lines and the three primary colours. The former home of the Mondriaan family constitutes one wing of the Mondriaan Villa Museum’s building. Villa Mondriaan was officially opened in May 2013 and it holds not only the art of Mondrian but other exhibits which illustrate that Dutch design is alive and practical. Dirk Vander Kooij uses technology to create chairs which are both functional and well-formed, and are also somewhat amusing. In 2009 he graduated from the Design Academy in Eindhoven. Yes, that town has a reputation for encouraging both design and technology. He presented a robotic arm designed to make objects as large as furniture from material that would otherwise likely find its way to landfill. In 2010 Dirk created an Endless chair which echoes Mondriaan in its simplicity of material, but here Dirk adds texture and utility to his projects. One thick plastic cord is extruded when soft, and woven by the ‘hands’ of a robot into a rigid 3D structure. The plastic is actually recycled from old refrigerators. 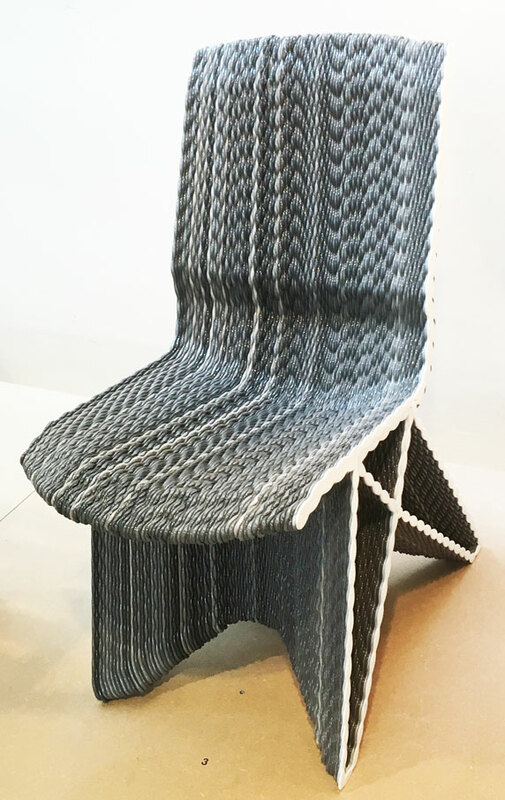 This resulting chair, and others in the collection, give the impression that they are knitted rather than moulded. This medium is a joy for designers. As Dirk says, mistakes and failures can be melted down to produce something perfect. Dirk Vander Kooij won the Dutch Design Award in 2011 with his ground-breaking Endless Chairs. Learn more about Dirk Vander Kooij here. But if we return to Mondrian’s ideal colour spectrum then we find the Red and Blue Chair. This is a chair designed in 1917 by Gerrit Rietveld. It represents one of the first expressions in 3D by the De Stijl art movement. Gerrit Rietveld was a Dutch furniture designer and architect. He became one of the principal members of the Dutch artistic movement De Stijl. Rietveld is famous for his Red and Blue Chair and for the Rietveld Schröder House, which is a UNESCO World Heritage Site in Utrecht. This colourful chair is actually the second version: the original chair was made of unstained beech. It did not take on its colourful Mondrian-esque persona until a couple of years later in the 1920s. Fellow member of De Stijl and architect, Bart van der Leck, saw his original model and suggested that it would look better with colour. 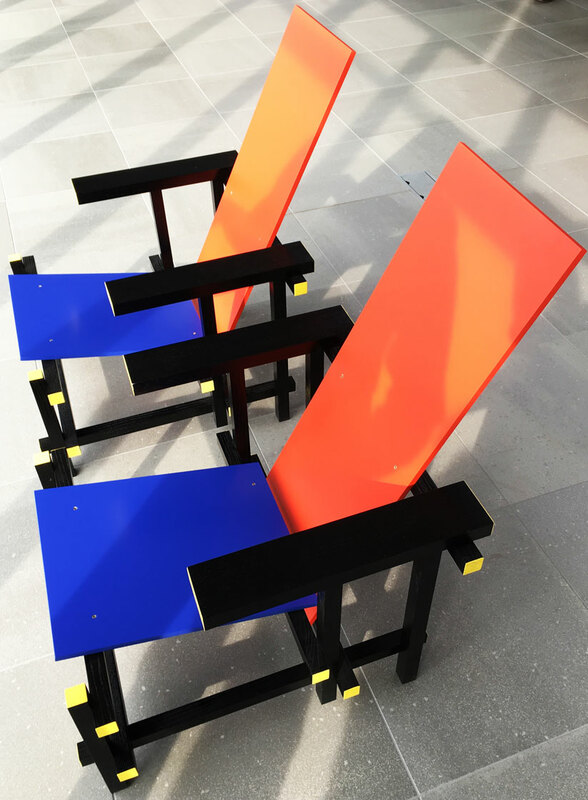 Rietveld built the new model of the chair with a thinner profile. It was entirely painted black with areas of primary colours reminiscent of Mondrian and the De Stijl movement. De Ploeg is the only industrial building designed by Gerrit Rietveld and also has one of his iconic chairs. Learn more here.